The reason assessment on mobile phones and tablets matters is because so many people have these devices, and there is a huge opportunity to use them. Sometimes it’s easy to forget how rapid a change this has been! I’m indebted to my colleague Ivan Forward for this visualization showing the increase in mobile phone ownership in 10 years. It’s based on data from the South African census reported by the BBC. As you can see, in the decade from 2001 to 2011, more South Africans gained access to electricity, flush toilets and higher education, but the change in use of mobile phones has been far more dramatic. 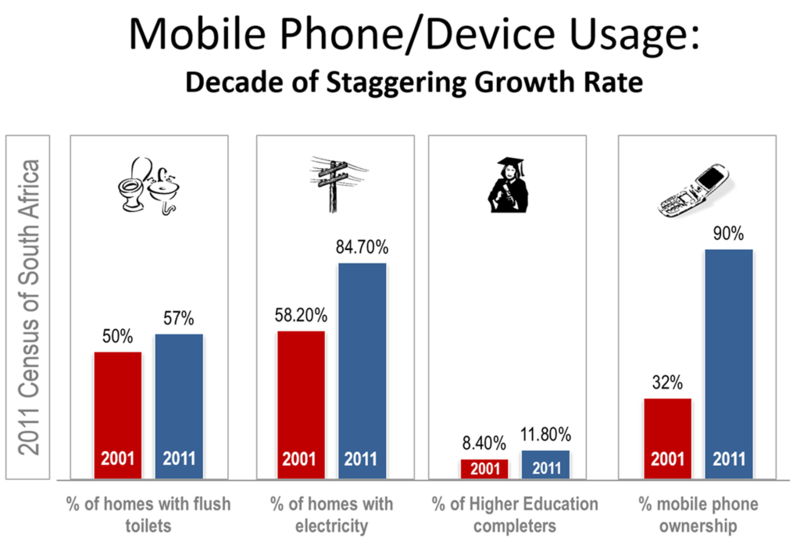 Figures in other countries will vary, but in every country mobile phone use has increased hugely. Not only does this explain why mobile assessment matters, it also explains why so many organizations (including Questionmark customers) are moving to Software as a Service / on-demand systems. Because of the rise of mobile phones, the parallel rise in tablets and the fast changing nature of mobile technology, you need your software to be up to date. And for most organizations, this is easier to do if you delegate it to a system like Questionmark OnDemand than if you have to update and re-install your own software frequently.